Social media can't be trusted, people come there to make new friends but often fall in trap of some psycho breeds who pretend to be someone they aren't. The figures released by Facebook claim that more than 80 million profiles on Facebook are fake, which is quite a huge number. Most of the fake profiles are made for spamming walls or groups by posting weird stuff, for increasing fan following of not so popular pages, for fun-dating and sometimes also for frauds. Many innocent and desperate people often fall in their trap without knowing that they are just talking to some stranger who has nothing better to do. Fake profiles are most likely to have the birth date as 1st January. This is because fake users are lazy enough to set a random birth date and often end up keeping the default value. So next time when you see a random friend request from a person unknown and who was unfortunately born on 1st January, then think twice before accepting. If you find a profile with inappropriate status updates containing horny comments or photos then just go away, it’s a fake profile probably created for flirting. You can also check 'What pages the profile has liked' if you find something unusual then just get rid of him ASAP! As I said earlier, most of the fake profile users are lazy enough to imagine fake stats and information like the birth date, and so is the rest of the information. 80 percent fake profiles have little to no information in the about section of their Facebook profile. A genuine user will have at least details about his hometown, school/college, work place etc. But most of the time fake profiles will only contain information like gender, a random birth date and one or two photographs (probably stolen from the internet), Before accepting new friends, do check about page. One of the many reasons why people create fake profiles is to spam Facebook groups or just have random fun by playing a prank on nerds, pretending to be a hot girl or something. If you observe fake profiles closely, you'll notice that these profiles have high number of friends, of course if you'll blindly add people to your friend list, you'll surely end up with a football stadium worth friends, I mean who will reject a friend request sent by a female? So I think you got my point ;) A large number of fake profiles are female profiles and their target is obviously men, and according to my experience, no men (let me correct myself, 'desperate men') will ever say no to a female. So jumping back to topic, If a suspicious Facebook profiles has thousands of friends then the chances of it being a fake profile is more than that of a dog playing 'Stairway to Heaven' on guitar, and I mean it. Nowadays even if a girl goes to a Restaurant washroom, she clicks a dozen selfies, so a female Facebook profile without any self photos is a clear indication that it is fake. If you see a Facebook profile stuffed with photos like random girl selfies, teddy bears, chocolates, flowers, couple kissing, photos with quotes that make you throw up, photos with 'I Love You' etc. kind of crap then it’s a Fake profile. If you see more than 5 photos of same person (girl) that still doesn't mean that the profile is genuine, take the test given below. Download any one photo from the suspicious profile. Wait a few seconds for the results to arrive. Check if the same image is uploaded somewhere else or not. Most of the times you may find that the image was stolen from some other social profile or website. Many spammers hunt down the images from other social profiles and then using them create a fake profile. This isn't an accurate point to consider whether a profile is genuine or fake, but still is of great help. New profiles are most likely to be fake profiles, unless you the person personally. If one day you find a friend request from a girl (which you can get even in million years) waiting for your approval and by chance was created recently then moving a rock on your heart, Reject It! Research shows that a big percentage of fake profiles are those which are created recently. Well this isn't very accurate, sometimes at the party you may have met some stranger and quickly bonded, then before you realized you've already exchanged phone numbers and sent requests on Facebook, next morning when you get sober, you find out who this person is? So this isn't an accurate method for spotting a fake profile but can be useful. If the profile has common friends as yours, it is more likely to be genuine. In case mutual friends are horny and despos then beware! Let’s see in this way, you accept a random friend request and that guy is being generous by liking all the crap you're posting and is also leaving comments on them. Then one day he/she starts chatting and after a casual 'Hello' starts asking questions like 'Do you have a Boy/Girlfriend?' or something similar. Just get rid of them. Celebrity profiles on Facebook have a blue color tick mark sign near their name. This states that the profile is verified by Facebook and belongs to the genuine person. 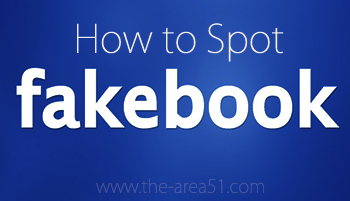 So these were some killer points to consider when you suspect a Facebook profile to be fake. I hope this article was interesting as well as useful.